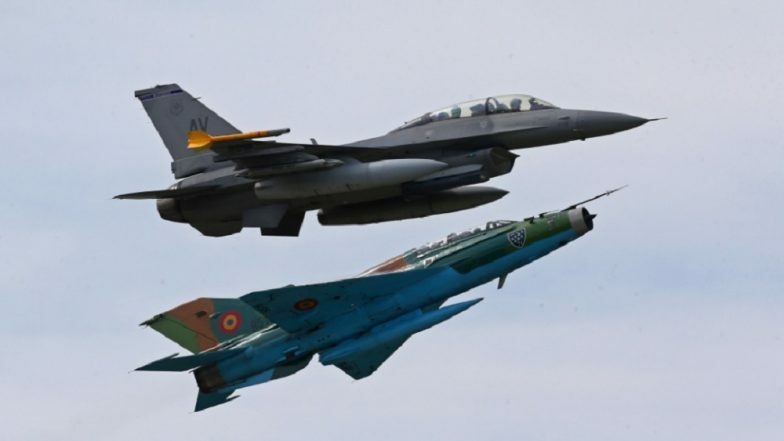 Islamabad, March 25: Pakistan's military has rejected India's claim that it used US-made F-16 fighters jets against India in retaliation to its pre-emptive strikes on a JeM terror camp in Balakot, saying that JF-17 Thunder combat aircraft developed jointly with China were used in the operation. Referring to the aerial dogfight with the Indian Air Force after the February 14 Pulwama terror attack claimed by Pakistan-based Jaish-e-Mohammed (JeM), Pakistan Army spokesman Major General Asif Ghafoor said the Indian jets violated the Pakistani airspace on February 26, dropping payloads without inflicting any casualties or damage to infrastructure. F-16 Was Used By Pakistan, IAF Displays AMRAAM Missile Part As Proof; All About The Evidence Presented by India (See Photos And Video). He noted that Islamabad was discussing the use of its JF-17 with the United States citing "friendly relations" with Washington, stressing, however, that the country would use whatever it deemed necessary if it came to "legitimate self-defence." He said Pakistan only wanted to tell India that it has the capability to hit back. He said Pakistan has the footage of the operation. "Pakistan holds the position that this capability eliminates the possibility of conventional war. No sane country having this capability would talk about using it," Radio Pakistan quoted Ghafoor as saying in an interview with the Russian News agency He said the Pakistan would take steps towards non-proliferation of nuclear arms but only if India does the same. Ghafoor said Pakistan would welcome every effort, including that of Russia, which can bring peace in the region. On military cooperation with Russia, Ghafoor said Pakistan is negotiating defence industry cooperation with Moscow in the areas of aviation, air defence systems and anti-tank missiles.